A robot from Earth has successfully drilled into a Martian rock for the first time ever and exposed pristine alien material for high powered science analysis. 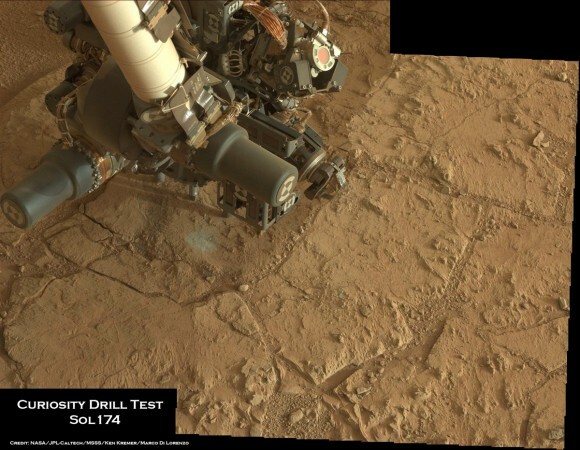 NASA’s car sized Curiosity rover deliberately plunged the drill bit on the end of her 7 foot (2.1 m) robot arm into a flat outcrop of rocks possessing hydrated mineral veins, that is situated inside a shallow basin named Yellowknife Bay where water repeatedly flowed. And what’s even more amazing is that as Curiosity hammered straight down into the rock outcrop, it appears that the resulting vibrations also simultaneously uncovered a hidden vein of whitish colored material that might be calcium sulfate – as the Martian ground shook and a thin layer of rust colored soil was visibly dislodged. The robot is working at a place called Glenelg – where liquid water once flowed eons ago across the Red Planet’s surface. Read more: Curiosity Hammers into Mars Rock in Historic Feat — Universe Today.